I am always awed by her baking and cake decorating skills and so asked her recently if she would share one her creations with us. 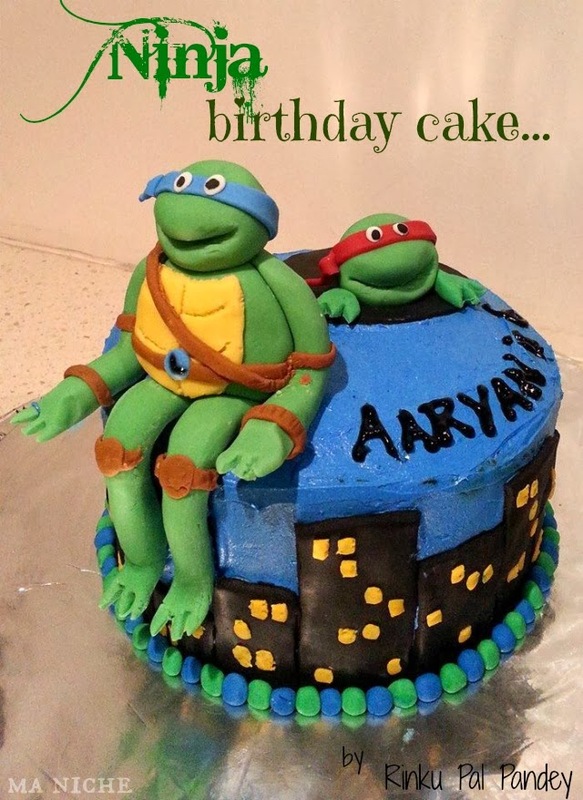 She readily agreed and few weeks ago shared this Ninja birthday cake . 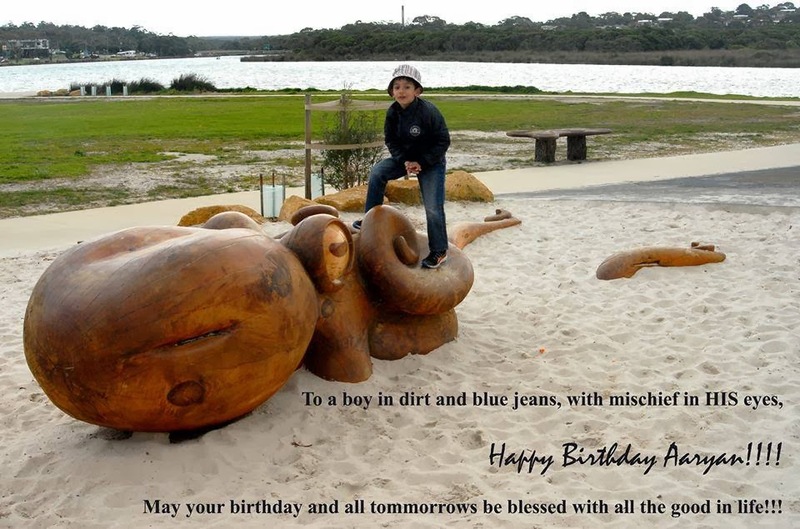 It is the one that she made for her son's 6th birthday. 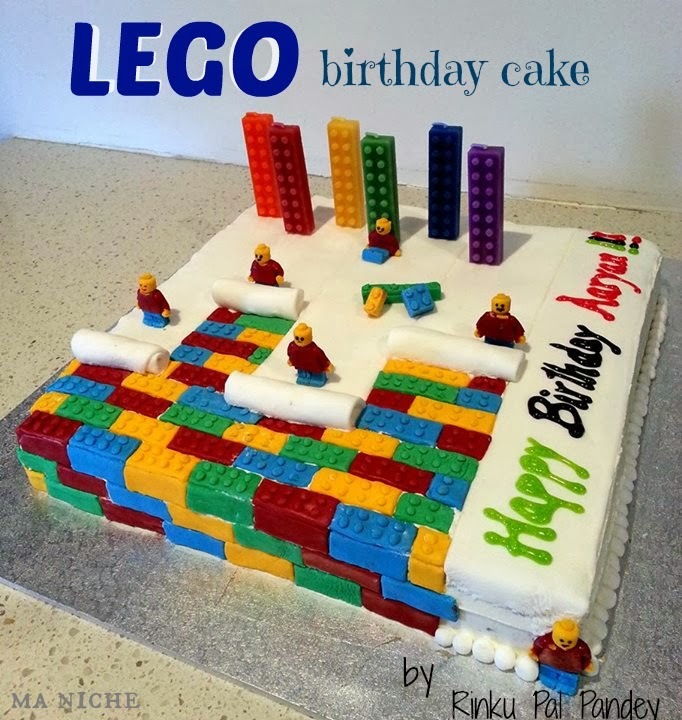 and in case it did not... this LEGO cake would have definitely swept the BIG boy off his feet !! Kudos to the supermom for baking such spectacular cakes and lots of love and blessings to the lucky boy with the supermom and a loving dad ! Total Time: 5 hours active time (including baking time) + overnight resting time for the fondant figures. Spray a 6 inch round cake pans with vegetable pan spray, or use Cake Release. In mixer bowl, cream butter and sugar until light and fluffy. Mix in vanilla and almond essence. Mix flour with baking powder and salt. Add flour mixture alternately with milk, starting with the flour; mix well. Pour into prepared pans and bake at 350° F for approximately 1 hr 20 minutes, till the top bounces back or the skewer comes out clean. Add vanilla. Gradually add sugar, one cup at a time, beating well on medium speed. Scrape sides and bottom of bowl often. When all sugar has been mixed in, icing will appear dry. 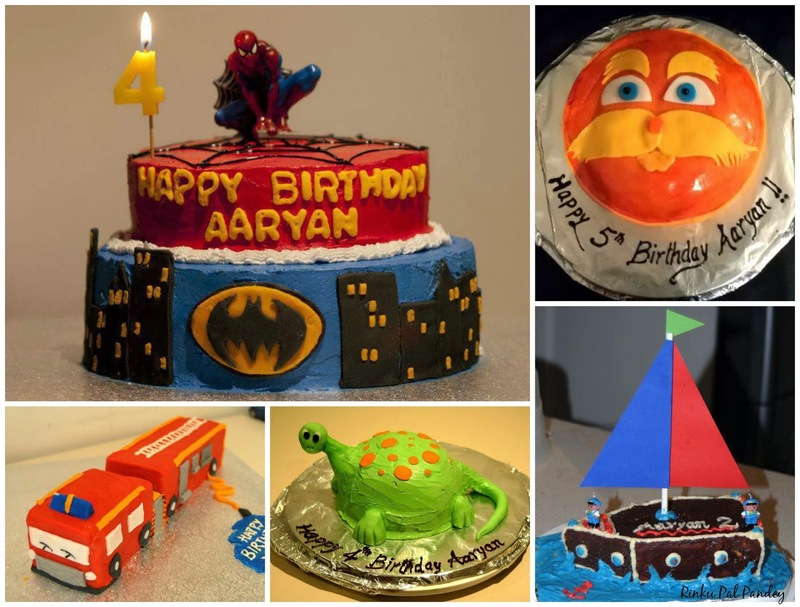 For the decoration, color the icing in any color you desire using the edible colors and using a spatula cover the cake evenly to get a creamy layer. 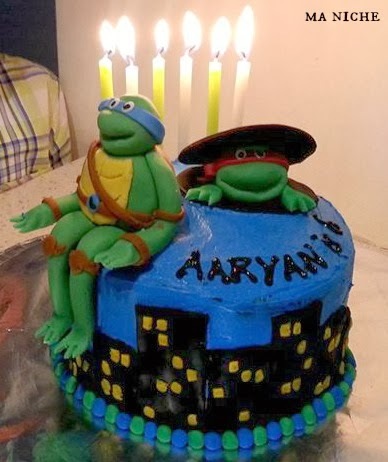 For the figures, fondant was colored using various edible colors and a hand at clay modelling was tried to get, in this case, the Ninja turtle character!!!! The figures and buildings were made a day before to allow them to harden overnight. The recipe yields a 6 inch round and 3.5 inch tall cake. Cut the cake into 2 halves and spread the buttercream icing between them. Stack the 2 halves with the sides with icing facing each other. Next spread the icing in the center of the stacked cake and cover it all over to get a smooth finish. Finally top the cake with the fondant decorations. The above recipe yields 7 1/2 cups of cake batter and approximately 3 cups of buttercream icing. Baking times and temperatures are specific to pans. For a 10 inch round and 3 inch deep cake pan, bake at 350° F for approximately 2 hrs till the top bounces back or the skewer comes out clean. Modelling the figures and buildings takes about 2-3 hours. The recipe is adapted from Wilton.com. The photo credits for this post go to Gunjan Panday and Rinku Pal Pandey. I shall be sharing this cake at all these parties. Hats off to your sister, amazing cakes. My son would loooove this cake! 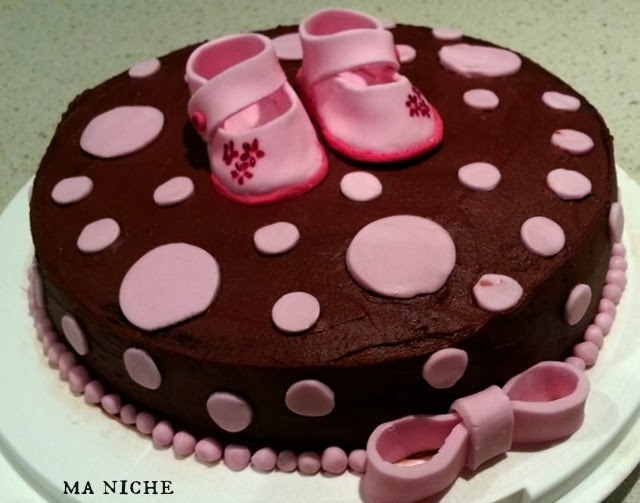 So creative and nice I wouldn't want to mess it up but taking a piece :-) checking this out from marvelous monday link party!